You'll see sounds. When you listen to Plasticland you will see sounds as colors, no doubt about it. As the garage revival of the early 80s kicked off on either coast you had the paisley underground on the west coast, and a fuzzed our garage rock revival on the east coast. And there in the middle you had Milwaukee garage revivalists Plasticland embracing the psychadelic flower-power sounds of the late sixties. Their first full-length record dropped in 1984, appropriately titled Color Appreciation. It was a tour-de-fource of mod sounding psychadelia with clear influences from The Creation, Smoke and early Pink Floyd. The group's second album upped the lush sounds and swirlingness, yet adding a jangly component more evocative of The Byrds. The production values were far superior and the album was a big step forward. Later albums in the 80s were more of the same, not bad but not exactly making any new advances in the band's sound. Plasticland never garnered even the success of bands like The Fuzztones or Three O'Clock, seen perhaps as a drug-induced trip down memory lane. In fact, their version of flower power was anything but. 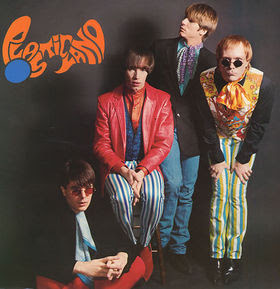 Rather than being derivative of the sixties, they actually created a modern sound that was unique and maybe too creative. In the end they probably lacked achieving more widespread exposure by being from Milwaukee as opposed to New York or L.A.
A nice compilation, Make Yourself A Happening Machine, appeared in 2006, although it was too over representative of their first album and left out some of the best songs from later releases. It did include the song here, "Flower Scene", which was one of the best off their sophmore release Wonder Wonderful Wonderland.